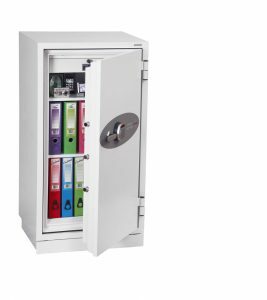 The Phoenix FS1901E Fire Commander series offers unrivalled protection for documents, data and Cash. 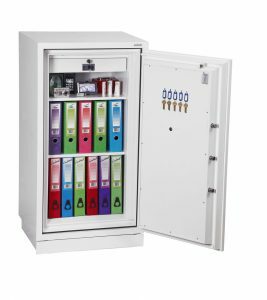 FIRE PROTECTION (PAPER): Tested to the Swedish NT Fire 017 – 120 Paper standard, providing 120 minutes fire protection for paper documents. 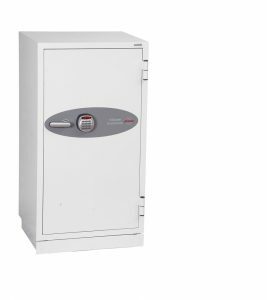 FIRE PROTECTION (DIGITAL MEDIA): Fire Protection for Digital Media: Tested to DIP120 – 60DM standard providing Up to 1 hr fire protection for DVDs, USB Memory stick and hard drives. SECURITY PROTECTION: Recommended for an overnight cash risk of £2,500.00 or £25,000.00 valuables. 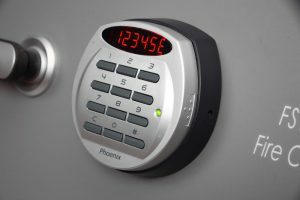 LOCKING: Fitted with an advanced high security electronic lock with clear LED display with internal alarm, dual control, hidden code and scrambled code that can be programmed as standard. FITTINGS: Supplied with 2 height adjustable shelves and 1 lockable drawer.